Written on the occasion of Laura Linney's 48th birthday. Director: Moisés Kaufman. TV Movie. Cast: Nestor Carbonell, Kelli Simpkins, Grant Varjas, Clea DuVall, Andy Paris, Dylan Baker, Tom Bower, Clancy Brown, Steve Buscemi, Kathleen Chalfant, Anne Cloud, Jeremy Davies, Nelson Embleton, Michael Emerson, Noah Fleiss, Peter Fonda, Ben Foster, Janeane Garofalo, Amanda Gronich, Leslie Henson, Bill Irwin, Joshua Jackson, Terry Kinney, Bhavna Kundanmal, Laura Linney, Amy Madigan, Camryn Manheim, Margo Martindale, John McAdams, James Murtaugh, John Nance, Garrett Neergaard, Summer Phoenix, Greg Pierotti, Christina Ricci, Richard Riehle, Lois Smith, Frances Sternhagen, Mark Webber, Lou Anne Wright. Screenplay: Moisés Kaufman, Leigh Fondakowski, Stephen Belber, Greg Pierotti, Stephen Wangh, Amanda Gronich, Jeremy LaHoste, John McAdams, Andy Paris, Barbara Pitts, and Kelli Simpkins (based on the play by Moisés Kaufman and the Tectontic Theater Project). My partner and most of my gay friends remember exactly where they were when they heard about the fatal assault on Matthew Shepard. I remember, too, but with qualifications that surprise me and even embarrass me. I read the news on the New York Times website, via a Netscape browser. I was sitting at the laminated wooden desk in my senior-year college dorm room, on my NEC computer monitor, connected by heavy cables to a 10-pound tower. I remember the image of the fence that hovered, ghostlike, over the article. But was this the night of October 7, 1998, the day Matthew was found on the rural outskirts of Laramie, Wyoming? The night of October 12, 1998, when he died in an intensive care unit in Colorado? Some date in between? Here's what I do remember about dates in between. My 21st birthday fell on October 9, 1998, exactly halfway between Matthew's targeting and his deathand, as The Laramie Project's script eventually reminds us, less than two months out from what would have been Matthew's own 21st birthday. My parents had driven up to Boston from the Washington, DC, area just to take me out for drinks at a booth we liked in Faneuil Hall. That was a Friday, and I spent most of the weekend with them, serendipitously winning a school election that same day, and being so glad to have their company on such a doubled occasion. They would have left on Sunday. Matthew, by then a worldwide headline, died on Monday. I don't remember us ever once talking about him; I don't even remember consciously not talking about him. Years later, my mom and dad both admitted how hard they had taken the news of a gay college student's lethal vulnerability in a place where he had felt reasonably safe, far away from home. I think they didn't say anything at the time because, two years after my own coming out, they knew I didn't begrudge them their worries but that I still found it hard knowing that Mom, especially, wasn't ready to disassociate my being gay from reasons to be fearful on my behalf: for my happiness, my safety, my prospects of having a family of my own. They knew that being gay was for me a source of happiness, pride, and contentment, even though the one relationship I'd had up to that point had only lasted about a month. They thought we were all equally aware of not raining on the birthday parade with talk of Matthew Shepard. But the truth is different: despite my horror upon reading the article, I don't honestly know how much I was thinking about him. I know that if I had not been out, or had more recently come out, I probably would have thought of little else. The idea of Matthew lashed to that fencewhile who knows what happened to him, and for so many hours afterwardand the ghoulish metonymy of the fence itself, still standing the next day when Matthew no longer was, is exactly the sort of thing that haunts a kid who knows he isn't straight. It can easily terrify her or him into keeping quiet about that, even into refusing self-recognition and acknowledgment. The same specter of Matthew lashed to that fence can also, as we soon observed, rally more politicized, more nearby, more confident, more furious, more devastated, more impatient, more quick-witted, more justice-focused members of the LGBT community to make sure the world knows and to demand a fair trial even as they grieve. Of course, it's easier to say that now, because in many ways Matthew Shepard's death was the occasion through which we learned what a local, national, and international outcry over a sexuality-based hate crime could look like, and what it could achieve. I think I fell between these two camps. It is absolutely wrong to say that I didn't care or didn't think about him. But when you're just out of a nest, you avoid strong winds just as much as you avoid returning to the place you've recently left. At least, that was true of me. I didn't identify with Matthew. I didn't really think, "That could have been me," which is what I would have instantly and chronically thought two years earlier or two years later, even though at that exact moment, barely two months older than Matthew was and sharing a great deal in common with him, the portal into reflexive identification should have stood wide open. It had been a victory to learn not to associate myself emotionally with every gay or lesbian person to whom something unjust or awful happened; meanwhile, the ability to associate myself politically with other gay people, with or without absorbing their pain as my own, had not yet fully set in. My family later told me they found my quiet about Matthew Shepard, if not eerie, then at least a sign that I wasn't ready to talk about iteven though I'm usually ready to talk (and talk) about almost anything. Even my older brother, deployed to Kuwait in the fall of 1998, was wondering how I was taking the news of Matthew Shepard's death, news of which had reached him in a desert in another hemisphere. I had an anti-Margaret experience: it didn't occur to me to appropriate a trauma that I was very conscious, almost to a fault, had befallen somebody else, even as I was surrounded by people who would not have thought ill of me if I had succumbed to paranoia, sorrow, or self-pity. As I've gotten older, I've learned how little you can predict what your own responses to other people's suffering will be. I carried on with my routines through the days and weeks after 9/11 almost without interruption, though not, obviously, without considerable distraction and worry. By contrast, I shut down almost completely for two weeks after Katrina, a situation in which it should have been hardest of all to project myself, based on any place or any way I had ever lived, or any statistic by which the U.S. census would recognize me. Parts of me have never switched back. In any event, as humiliating as it now feels to admitbordering on self-criticism, because I find myself wishing I had reacted differentlyI was thinking about Matthew and putting myself in his shoes much less than everyone else in my family was. 1) Can the actors relate to the people they are playing? 2) Can the actors or the "characters" relate to Matthew, whatever they think about him, or about people like him, or about what happened to him? 3) Can the citizens of Laramie recognize themselves in each other? 4) Do the Tectonic ensemble members identify with the project they are creating, and approve the work required to create it? 5) Do this story and this town invite identification from the outside, or do they resist it, belonging principally or even exclusively to each other? This last question comes swiftly to life in the very early scene where Kaufman, played by Nestor Carbonell (now famous as Gotham's kohl-eyed mayor in The Dark Knight), meets with Rebecca Hilliker, a University of Wyoming theater professor who was a key liaison for the Tectonic group as it made its way to the town and started getting to know its shell-shocked and understandably suspicious citizens. Camryn Manheim is instantly plausible as Hilliker, inviting but also a bit dazed. She gives an ideal reading of a key line, in response to Kaufman's opining that what has happened to Matthew, lying comatose in a hospital, has by now transcended Laramie and become a spectacle, a crisis, and a crucible of meaning for the whole world. "For me," Hilliker responds, halfway between airing a difference in perspective and offering a semi-stern corrective, "it's still about Laramie." From this point forward, the whole play and hence the film represent an inconsolable working-through of the stakes of this dispute. Does the assault on Matthew Shepard teach us something about Laramie or about life? Can Laramie serve, or should it, as a mirror for our own worlds, wherever they are centered? Is it doomed to the status of an exotically rural Otherplace, onto which coastal and metropolitan prejudices are projected? Can the actors open out wider dimensions in the story of Matthew, not by denying Laramie's particularity but by digging so relentlessly into the specifics, the semantics, the sensibilities, and even the stutters of the residents? These questions are thorny, maybe even unresolvable, but they motivate the unusual theatrical practice of Kaufman's company, which gathers testimonies and then adheres scrupulously to wording and tone as they shape and perform a script, even if behavior or inflection might be adjusted for dramatic effect. It is hard to say, and not the question I am most eager to adjudicate, whether this protocol entails an apex of verisimilitude or yet another mode of breaking the fourth wallsince the actors are often tempted to bold-stroke some aspects of their vocal and gestural deliveries, certifying their own distance from the characters they nonetheless ventriloquize so punctiliously. How, then, do the actor-producers respond to politically volatile and personally provoking testimonies, which their project forces them to coax out from a variety of sources, with a minimum of input or pushback? The Laramie Project includes one scene, ironically following a particularly rewarding exchange with local clergyman Roger Schmit (Tom Bower), in which Tectonic troupe member Amanda Gronich (Clea DuVall) has to swallow some especially homophobic rhetoric from another local reverend (played by Lost's Michael Emerson). Amanda cannot pollute his testimony with her own reflexes to challenge or upbraid. They need his story. In the face of resistance, he'll say nothing. Duvall's conflict is more affecting as we watch her straining to suppress it than in the borderline histrionic scene in which she vents her frustrationpossibly because Laramie doesn't pick this thread back up or show us any similar moments. It's an interesting window into a complicated process, but it gets closed almost immediately as it's opened. Then again, it makes sense that the visitors' travails might be unseemly to emphasize, in juxtaposition to a town and (eventually) a family or two that has struggled with so much more. It's really the first three questionsthose around the actors' intimacy with their characters, the townspeople's rapports with each other, and everyone's ability to build empathetic bridges to Matthewthat propel the rest of the piece. The text is crucially about the ineffaceable distance of the bystander, but also about the importance of projecting oneself into shoes and souls that are different from one's own. As a result, it's hard not to keep one eye trained on one's own extensions or withholdings of identification with each character on screen. Do I like this person? Do I see myself in her? Can I imagine acting similarly or differently, faced with the same circumstances? My own sense is that Laramie gets off to a slightly shaky start, possibly because I felt distracted by my own memories of responding (and not responding) to Matthew's case, but also, I think, because Kaufman has structured so many scenes as one-on-one or two-on-one exchanges between Tectonic emissaries and the actors playing the Laramie residents. These are usually played in tight close-up, particularly where the all-celebrity cast is concerned. Though the assembled repertory can hardly be faulted in their collective talents, much less in their sense of palpable devotion to the project, the camera is not in every way their friend. Perhaps too self-conscious of the unusual dramaturgical process that produced The Laramie Project, several of the actors seem to draw attention to the halting sentences, the odd verbal cul-de-sacs, and the scattered "uh"s and "um"s in their dialogue. Even performers as seasoned as Frances Sternhagen, Steve Buscemi, and Margo Martindale initially feel the slightest bit snagged on this problem. At root may be some pressure to honor Kaufman's form and to demonstrate their own virtuosity by trying to reveal character through every bit of broken syntax. On the other hand, the actors may have understandable jitters in playing very real people who themselves would have the jitters talking to strange New Yorkers in the wake of a ghastly eventone for which they expect to feel judged, directly or indirectly. Maybe the awkwardness of these early scenes is unavoidable. Either way, the film has trouble jelling for a while. Again, it can't help that the townspeople themselves are not really able to interact with each other and have been so compartmentalized by Kaufman's montage as freestanding interview subjects. The performers who fare best for the first 20-30 minutes of The Laramie Project are those who do the least "acting" and those who find the most to act beyond the manifest feelings or memories their monologues express. In the former category, Tectonic troupe member Kelli Simpkins, cast not as herself but as one of her own colleagues, quickly establishes a rich, relatable performance as a close listener on unfamiliar ground. Hers is a consummately undemonstrative performance and yet it's the opposite of colorless, and her face remains a touchstone throughout The Laramie Project, whether in silence, most often, or in rare moments of release. Ensemble member John McAdams also crosses capably into acting for the camera, in his candid, unfussy rendering of Jonas Slonaker, the gay owner of a ranch on Laramie's periphery, who speaks of his love for the town. Jonas is saddened but also frustrated by fellow gay men he meets in larger cities who used to live in Laramie and describe how much they miss it. "Why don't they just live here?" he asks. He's aware of the most obvious answers, given the circumstances in which he is interviewed, but he is unwilling to cast Laramie off as a place from which men like him must necessarily flee. Among the more recognizable faces, Jeremy Davies is well-cast and very involving as a theater major at the University of Wyoming who speaks in depth about his parents' protests when he chose a fragment of Angels in America as his audition piece for the program. Davies's character, Jedadiah Schultz, the inspiration for whom can be spotted here and there as an extra in The Laramie Project, is a signal example of a character who meditates unselfishly on Matthew's fate, but nonetheless does so in terms of how this event refracts upon his own history. Simultaneously, he is still very much caught up in his present world of auditioning, improving, and making his way as a 20-year-old. Davies is thus freed up to play a wider range of emotions and quickly shows us a multi-dimensional character rather than a talking head. Similarly successful, in witty and maybe unexpected ways, is Joshua Jackson, a recent alumnus of Dawson's Creek at the time The Laramie Project was filmed. He plays Matt Galloway, the bartender who on that fateful night saw Matthew Shepard in the ill-boding company of Aaron McKinney and Russell Henderson and now regrets his reluctance to intervene. At the same time, Matt is eager to give persuasive, easygoing credentials of his own acceptance of gays and lesbians. He cannot help refusing the killers' claims that Matthew angered them by hitting on them. After all, Matthew never once hit on him, "and, I mean, come on, you know?" Jackson makes Matt cocky but not off-putting, full of nervous, hormonal energy as well as reflection. Not coincidentally, he has the benefit of a fully fleshed-out location to play off of: the visually and sonically rich environment of the bar, captured in close, medium, and long shots. In combination with its vividly sketched environment, this amiably rounded performance offers another sign of The Laramie Project's potential to exceed the level of an exercise and attain its goal of elucidating a culture in direct, intimate terms. For my money, and as sobering as it is to say, The Laramie Project fully turns that corner only once it reaches the testimonies of Aaron Kreifels (Ben Foster), the devoutly Christian student who discovered Matthew barely hanging on to life during a cold autumn-morning stroll, and of the cops Reggie Fluty (Amy Madigan) and Rob Debree (Clancy Brown), who responded to Aaron's call. Is this the pivot because the impact of Matthew's suffering finally pervades the film in a new, more direct waynot just his "loss" or his "passing" or "what happened" but the forensically horrifying and emotionally shattering details of his attack? Whatever the case, Foster movingly shows us a fellow college student who could never expect to have crossed paths with Matthew, yet who now trembles for Matthew, shaken in his feelings and in his faith by this encounter with life and death, with cruelty and its legacy. Brown, among the most perennially reliable but under-rewarded character actors of the last couple decades, and Madigan, among the toughest, truest, least self-congratulating of all actresses, preserve the practiced carapace of police officers while showing us, in lithographic detail, the violence that this episode has done to their own conceptions of home, and of human behavior. Madigan's Reggie is in some ways the first character to whom something "happens" that exceeds the fact of Matthew's demise even as the two events are inextricable. Her stunning concision and integrity ensure that The Laramie Project never seems like it's using the predicament of an "innocent" mother to assuage those members of the audience who might be wondering if Matthew "had it coming," which is what some of the other interview subjects staunchly believe. Most of all, Madigan and Brown, like McAdams, Davies, and Jackson in their very different performances, use their close-ups brilliantly to show us habits, expressions, and shifts in mood that disclose not just an individual personality but a local way of lifea community that is by no means monolithic but which expresses itself tangibly in what people say and don't say, when they establish eye contact and don't, what counts as a brave utterance and what counts as a "simple" fact. From here, The Laramie Project moves from strength to strength. Not every scene or monologue is given the same room to breathe, and one occasionally wishes for more restraint from the score or less artificial lighting from the cinematographer Terry Stacey, whose images sometimes lack the kind of Laramie-specific tonalities that the script and the actors have worked so hard to evoke. Still, the scenes are doozies: the gay and lesbian residents of Laramie coming together as a "community" for the first time, and suddenly finding it difficult to speak; Laura Linney, dangled early and briefly as an apple-cheeked promise of sympathy for Matthew, only to reveal herself in her big scene as a font of candid incomprehension and blistering moral judgment; the series of press conferences outside the hospital where Matthew is convalescing, or isn't; the outrage of college student Zubaida Ula (Bhavna Kundanmal), in response to too many people's attempts to project responsibility for Matthew's fate onto select individuals, or onto abstract forces; the pleas of a grandmother and the undisguised censoriousness of a judge; the spectacle of a show-of-support parade that begins as a trickle and ends as a surging stream. This last episode benefits from incorporating much more natural light, a richer use of locations, and more specific visual perspectives than Laramie usually does. It profits too, immeasurably, from Bill Irwin's astonishing delicacy in a single scene as Harry Woods, another gay resident of Laramie living in virtual isolation right there on Main Street, who roused himself to the window one day and literally could not believe what he was seeing. Reader, I cried and cried: not just at what happened to Matthew but at the spectacle of people, alone or together, trying to make sense of what happened to Matthew, whether or not they approve of him personally, or of the influx of global attention his case elicits. I would like to believe that the emotional power but also the coolly inquisitive spirit of The Laramie Project would exert a claim even on viewers who tuned in not knowing what they believed, or who doubt their sense of any personal stake in what happened to Matthew Shepard. I'm badly positioned to speak for such a viewer, but as unwilling as the movie is to make apologies for the most virulent bigots (i.e., Fred Phelps and his notoriously self-promoting cult), it does not cast out of hand every figure who denounces the furor over Matthew, or who refuses to offer the pious responses they feel are expected of them. Linney, for example, admits some notes of hysteria into her voice, and yet she doesn't editorialize too much on the vantage of a woman who is baffled by the idea of "hate crimes" as a special category of violence: "A hate crime's a hate crime. You murder somebody, you hate 'em!" is her perplexed response. The only time Laramie seems to double-fault on its principles is in the interview with Aaron McKinney, the more harshly sentenced of Matthew's killers. That conversation is filmed in heavy black shadow, like a slicked-up version of Eastwood style. It transpires in an abstract cell, with a pair of cameras orbiting Mark Webber as McKinney as well as his interviewerKaufman, I think, but the atmospherics are so overweening that I already cannot recall the details. Of course one can understand the temptation to paint McKinney in such stylized, diabolical strokes, but one of the ethical refrains of The Laramie Project, spoken by several sources, is the need to acknowledge this brutality not as the expression of fundamentally evil natures but as a choice made by human beings, reared among us. I think the film comes too close to the false moral comfort of treating Aaron visually as a Prince of Darkness, rather than sucking up the courage to train the camera on him as it would on any other citizen of Laramie, even if what Aaron did places him at an irrecuperable remove from his friends and neighbors, in more ways than one. I admit, too, to second-guessing the ending of The Laramie Project. 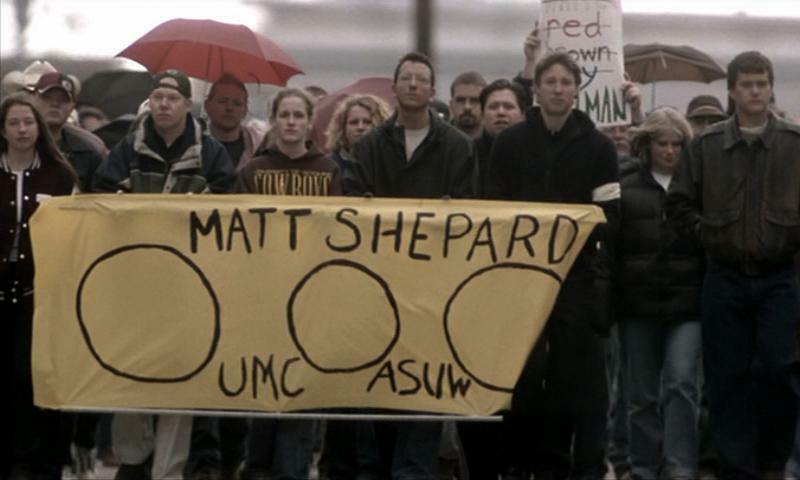 You can see why the filmmakers are unsure how to follow the court testimony of Matthew's own father (Terry Kinney, moving but not maudlin), and of how to coax this movie toward even a provisional resolution after opening so many Pandora's boxes of mourning, regret, bewilderment, resentment, and unease. Some of the final interviews help to smooth the landing, but I wish the visual image of Laramie itself didn't predominate quite so much, and not in such a dangerously aestheticized way. Doc O'Connor (Steve Buscemi), an acquaintance of Matthew's who occasionally took him driving along gorgeous country roads, describes returning to the spot where Matthew lay dying. He finds some comfort in the fact that, right at dawn, as the sun would have come up on Matthew's final morning outside of an ICUhaving survived a night of the intensest violence, though not for very much longerhe would have beheld a city he claimed to love, shimmering and diamantine in the valley, recumbent against rolling hills and plains, beneath a grand Wyoming sky. Doc hopes, and maybe the film does, too, that Matthew found some peace in this image, especially if it was his final conscious perception. I find this hard to accept, and even hard to listen to. When I dwell too long on such a speculation, in contrast to the darker, more terrified, more pain-stricken thoughts that I find all too easy to imagine as Matthew's last, I admit to finding the proposal almost offensive. But then I remember my own somewhat qualified, somewhat delayed, even somewhat forestalled impulse to identify with Matthew, who probably means more to me now than he did in the weeks after he passed, when he "should" have felt like an even more immediately tragic figure, an even more tempting and terrifying alter ego, an even stronger spur to take more collectively-minded action than I ever did in the fall of 1998 or the winter of 1999. I can see in hindsight why I must have felt what I felt, and why I let Matthew in in some respects but blocked him out in others. I expect that Doc O'Connor and, in turn, Moisés Kaufman are giving voice to the ways they needed to think about Matthew at the moment The Laramie Project endsmaybe the only ways they can handle thinking so much about Matthew. I surely owe them some benefit of the doubt.